TLG® texts became available to the scholarly community first on magnetic tapes (in the mid 1970s) and later in CD ROM format. CD ROMs A (1985), C (1988) and D (1992) were produced with technical support from 'the Packard Humanities Institute (PHI). 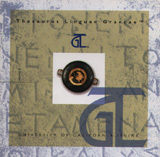 TLG® E (2000) was produced entirely in-house by the TLG team following the migration of the corpus from the Ibycus system to the Unix environment. Read more about the history of the TLG.